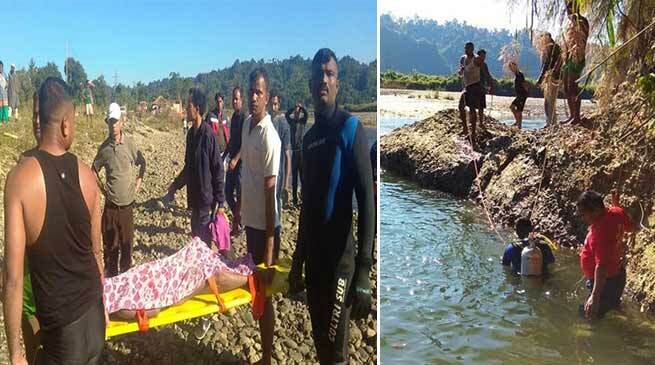 NDRF team based in Doimukh, Arunachal Pradesh retrieved two dead bodies from different locations within 24 hrs . A 11 years boy namely sameer sangami on Sunday was drowned in pare river at Mani picnic spot, near Mani secondary school, dist papumpare. After receiving the information a team of 12th bn NDRF, Doimukh under command of inspector Rahul Ranjan and under supervision of Arun Deogam, second-in-command rushed to the incident site and started search operation with the help of boat and deep divers. After few hours of searching and hard work by deep divers, NDRF team retrieved the dead body of the boy at around 13:35 hrs on 23/12/2018 and later handed over the dead body to local police. Another incident of car accident happens on the 24/12/2018 mid-night at 00:45 hrs, where a car falls in ditch approx 70 feet downward from highway between Ganga-Zulung road, near SP office. As an when information received, NDRF team under command of inspector Mintu Sonowal, under supervision of Vimal Gupta, assistant commandant moved to incident site and started search operation. Later the man in the car is identified as Taking Tasing, age 31 years, resident of village- jomo, dist- Siang and the car was Maruti Alto with registration number as-07d-4893. NDRF team successfully reached to the car after a hard struggle and recovered the dead body from the car and handed over to local police.